With that out of the way, let’s jump right in! 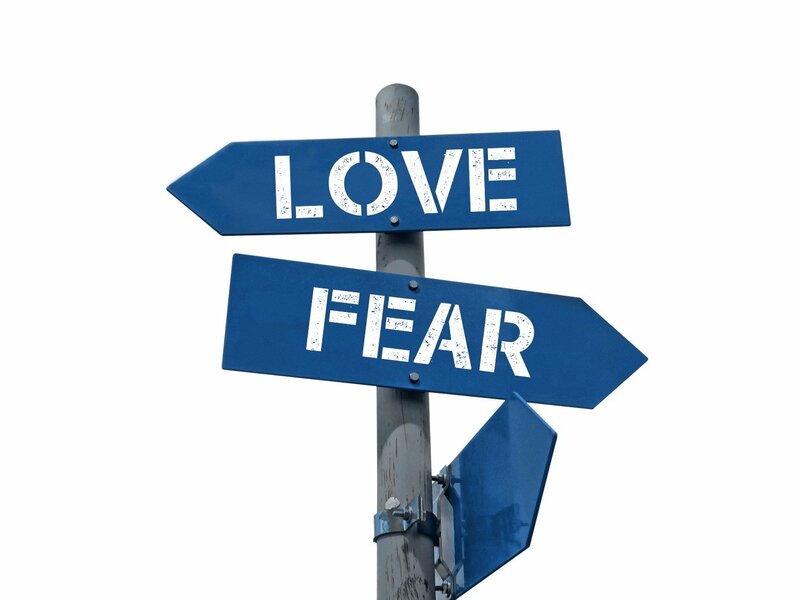 If Christianity is based on Love, why is there so much fear involved? How can there be Free Will if our “wrong” choices lead us to eternal damnation? Why would a loving God destroy over 70% of His children just because they either aren’t Christians or haven’t been exposed to Jesus’s message? 3) The significant difficulty in accurately translating from Greek and Hebrew to English (there are tons of examples of incorrect Bible translations too numerous to mention in this blog post – see Dr. Joel Hoffman, author of The Bible Doesn’t Say That: 40 Biblical Mistranslations, Misconceptions, and Other Misunderstandings for starters). Basically, it boils down to the fallibility of human beings. For me, the primary issue (as you can tell from my tagline), was that of fear. No, as a practicing Christian I didn’t walk around being afraid of everything. Yes, the members of my church were loving people! But, ultimately, Christianity’s theme (not Jesus’s original message) is one of control through fear – we behave ourselves (like good children), because we are afraid of the consequences. To me, he hit the nail on the head (at least MY head)! Human beings operate – in all areas of life – based on a system of behavior control through the mechanism of punishment and reward. Parents exert control over their children, governments control their constituents, bosses control their employees – it’s how we live! Why would we expect religion to be set up any differently? After all, religion is a man-made institution. I believe in an unconditionally loving God, a God with whom I will reunite upon the death of my earthly body, regardless of the choices I make in this life, because I believe His promise of Free Will. The idea that the truth of God can be bound in any human system, by any human creed, by any human book, is almost beyond imagination for me. I mean, God is not a Christian. God is not a Jew or a Muslim or a Hindi or Buddhist. All of those are human systems, which human beings have created to try to help us walk into the mystery of God. I honor my tradition. I walk through my tradition. But I don’t think my tradition defines God. It only points me to God (Spong, 2006). On that note, I want to thank you for reading. Thank you for opening your mind and heart to the possibility that God is more than any human being could EVER attempt to define, regulate, interpret, or pigeon-hole. To listen to the entire interview, click the link below. Fascinating read. The will to believe is an important one, so it’s important to fear-set so we can attune ourselves to future events. But love is the most important of all. Thanks Wells! I would love for you to elaborate on the concept of fear-setting. Are you saying that humans need some measure of fear in order to make determinations about their future actions? What a brave post! My father once tried to convince me that I should believe because, “What’s the worst that could happen? If’ I’m wrong,” he said, “nothing happens and you just die. But but if you’re wrong. . .” The threat of eternal damnation plays on our biggest human fears–pain, loss, abandonment. My dad wants to “see” me in heaven, because his won’t be perfect without me there. But that’s just it, right? A loving and generous God can’t grant the heaven of one believer, by condemning his beloved daughter to hell. That doesn’t make sense in a human context. But as you point out, God is a mystery. And I’m perfectly okay with that. Ponder the notion of “eternal life” for a moment and its not about living in a human body forever, it means “without time.” Can our brains even conceive of that? Mine can’t. So I allow the mystery and focus on love. Angela, thank you for that thoughtful response! You completely encapsulated the entire “argument,” if you will, when you said: “God can’t grant the heaven of one believer, by condemning his beloved daughter to hell.” Amazingly well put! What is sad, as you mentioned, about discussing this with other Christians, particularly when they are family members, is that you can never make them secure and happy – you can never relieve them of that fear. They will always be afraid for you because you didn’t choose correctly. Love is what is the basic tenet of every religion in the world. The problem arises when people equate lack to belief in a practice to fear of something going wrong. That is so true, Parul! When you strip down each religion, love is at the core. But, as humans, we seem to screw it up from there! A little fear is good but love is required in big doses! Exactly, Rita! As I’ve mentioned in other posts, small doses of healthy fear keep us on our toes! I’m so sorry that your experience of Christianity has been one primarily of fear. You might want to try one of the “mainstream Protestant” denominations, or else one of the more progressive versions of protestant Christianity? I’ve grown up in the latter (United Church of Christ) and am now raising my children in the same, and we focus not on the fear you describe, but on the trinity’s immense love for all creatures, as an example of how we should in turn love and treat all other living beings. Awesome, Flossie! So glad you were able to find the right church (and in time to raise your children in it). As I mentioned, I didn’t live in fear as a Christian, per se, but the entire concept is, for me, fear-based. The idea of Hell and the disbelief in reincarnation are two basic tenets that are deal-breakers. Those concepts seem to undergird the foundation that a person must be “good” and “choose correctly” because otherwise, there are severe consequences and you only live once. No one would want to risk an eternity in Hell, in other words. I’m curious, since your church is still Christian, how do they tackle those ideas? Hell is being out of relationship with God, which once you know the love of the Trinity, would indeed be truly awful. Heaven is being part of an ongoing relationship with God that is more amazing than anything we can imagine, let alone experience, in this lifetime. As for “finding” the right church, it was more I was fortunate to have been born to parents who went to church in this tradition (though my mom was relatively new to it – she grew up Catholic but when she and my dad, both divorcees, married each other, they went to his church because hers would not have them.) Yes, we’re supposed to be “good” (i.e., follow the example and teachings of Jesus in how to treat each other, starting with the Golden Rule), but we do so not out of fear of eternal damnation, but because it’s the right thing to do (treat others as our neighbor/as we’d want to be treated) and because it makes the world a better place. There are actually a lot of people in the United Church of Christ who, like my mom, were raised in other types of Christian churches that they later left. As in, left partly b/c the message of God’s love for us/Jesus’s example were not the ones that were emphasized, and did not mesh with their understanding of the Bible’s message of God’s and Jesus’s eternal love for all of us, mistake-prone humans though we may be. Thank you for taking the time to share that, Flossie! It would be awesome if more people could get back to the roots of their religion, with the emphasis on love and service. My biggest fear is death and not *really* knowing if heaven exists. Other than that, when I pray, I feel immediate comfort. Interesting read. Thanks for sharing Katie! It sounds counterintuitive for a Christian, but my curiosity about mediums and all of the messages I’ve heard from them (similar and consistent messages) have confirmed to me that there is no death and there is nothing but love. We simply transform from the physical to the nonphysical and back again. Love never dies! I love questions like these because they are so difficult to answer. There is a book I had to read in one of my college courses called “Letters From a Skeptic,” and it actually answers some of the really difficult questions that Christians get the most! Hi McKenna, thanks for your comments! I think I will check out that book…sounds interesting.